Craftster Community > NEEDLEWORK > Needlework: Completed Projects (Moderator: kittykill) > damask napkins embroidered! One of my close friends is getting married at the end of next month, shehas been dating her fiance for nearly 4 years, and we all were close friends in high school. She is not a traditional kind of girl, she likes to write stories and is exceptional at singing and acting. ever since i have known her, she has always drawn this star emblem with arrows pointing towards the center, she even got it tattooed on her back. 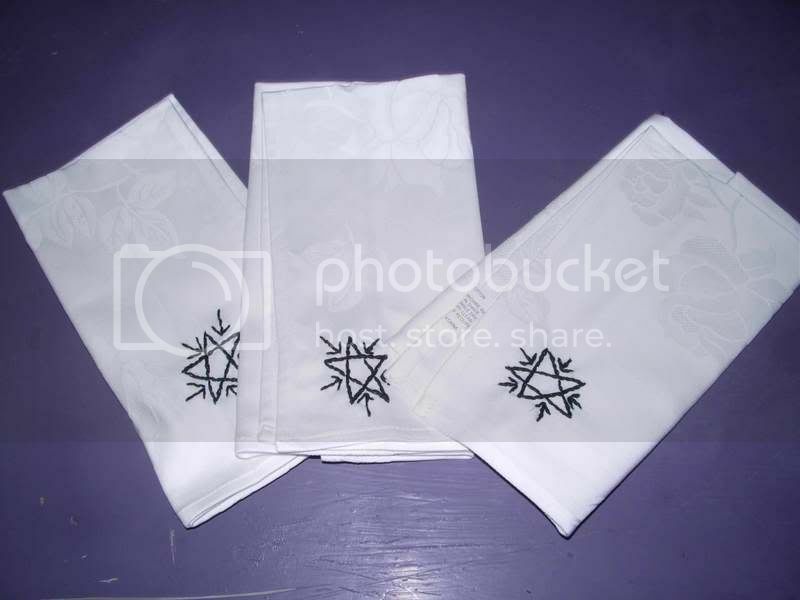 so when it came to finding a good present for her 'kitchen tea' i chose to buy her some napkins and embroider her symbol on them. What a personal and considerate gift! How thoughtful! She'll love them and know how much you care that's for sure!